Description: This listing is for One holster; buyers, however, may take any number of extras we have on hand at the same per-holster price, and with no additional shipping charges. 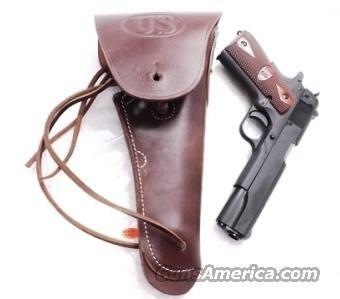 Here is a very nice replica of the U.S. Army issued holsters for John Moses Browning’s 1911A1 pistol that went into service in World War I, and has now continued to protect and serve our country for more than a century. Photo specimens and their identical mates are some we found in an old Appalachian Warehouse recently. Manufacturer is Surya Company of Dehradun, Republic of India. This holster will fit any 1911 type pistol whose barrel measures 5 inches or shorter; and that includes everything from Armscors to Colts to Umarex .22 copies to Wilson Combat pistols. Our Cousin Ernest from Mississippi even carries his Ruger 22/45 in one of the old originals. Like any new, real leather holster, the first two weeks will be a very tight fit. If that weren’t the case, leather holsters would get too loose too quickly. Construction is .155 thick tanned Moroccan style genuine cow leather, just like the originals. This holster has more of a mahogany brown finish, whereas our #002 has a lighter, more reddish finish. ALICE retaining plate on the reverse side is secured by copper tabs, not as slickly finished as the brass tabs were on the original Boyts, but good enough. Flap stud, instead of being brass like the originals, is glossy anodized aluminum alloy, and it’s good enough, too. Dimensions are exactly like the originals, from the top of the US marked flat to the blue steel eyelet that holds its genuine leather leg string strap. Color, as the photos show, is Mahogany brown leather finish. We’re offering these excellent Replica holsters, the ones in the photos or their identical mates, each	for only	$ 39.00. $3 Lower 48 First Class Mail; $10 Priority to AK HI PR. Buy 3 Ships Free: Combine any 3 of our items, and get free shipping. Lower 48 only, excludes long gun barrels and gun cases. $3 lower 48 on 1 or 2 items. $10 combined shipping to Ak, HI and PR no matter how much you buy, excludes long gun barrels, swords and gun cases.